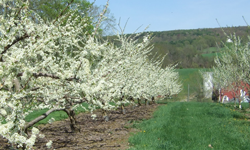 Consider a beautiful Destination Wedding at Alyson’s Orchard! Create a unique & unforgettable wedding that your guests will be talking about forever! With crystal clear waters, rolling lawns, and stunning maples enveloping it, Rachel’s Pond is an idyllic setting for any small wedding. Rachel’s Pond emits a quiet, homey feeling, especially under the structure of the grape arbor. Located very close to Robert’s Hall, guests and wedding party alike can get from ceremony site to the reception in the Orchard Room in just a matter of minutes. This also makes it ideal for chilly, winter ceremonies, if you choose to get married outdoors in the snow! 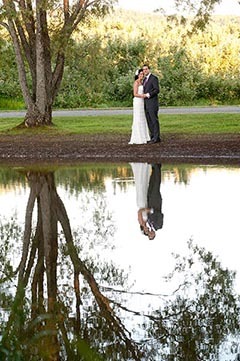 If you prefer more expansive views consider getting married at Ann Marie’s Point of View which overlooks the picturesque farms of Walpole or Ilze’s Point of View with its breathtaking views of the Connecticut River Valley. Perhaps a relaxing setting by a pond with fantastic views to the West sounds like the ideal site for you, then Sarma’s Pond would be your choice. If a place of serene beauty in the towering pines is your desire, then look no further than Martha’s Point of View. Why should a wedding celebration be just one day? At Alyson’s, we believe this time with family and friends should be savored. Take advantage of our incredible lodging facilities, and invite family and friends to make a weekend of it. 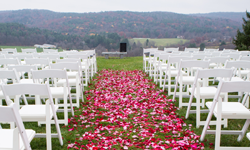 Come see why Alyson’s is the place in New England to be married, whether you choose a destination wedding, a mid-week wedding or a Sunday sunset wedding. 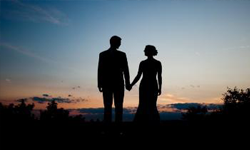 It’s easy to check your date availability, or get additional information about weddings at Alyson’s. Just fill out our online reservation form on any of our package pages or call us at or 603-756-9800.